Maximum likelihood is one of those topics in mathematical statistics that takes a while to wrap your head around. 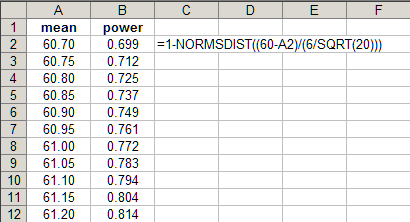 At first glance it seems to be making something that seems easy (estimating a parameter with a statistic) into something way more complicated than it needs to be. For example, a frequent exercise is to find the maximum likelihood estimator of the mean of a normal distribution. You take the product of the n normal pdfs, take the log of that, find the first derivative, set it equal to 0 and solve. You find out that it’s , i.e., the average. Yes, it’s good to know theoretically why we use to estimate the mean, but why would we use anything else? To me, way back when, it was akin to a long elaborate Rube Goldberg process to show that 2 + 2 equaled 4. I didn’t see the use of it. Of course if you stick with statistics long enough you find that maximum likelihood is indeed very useful, especially for proving results regarding efficiency and sufficiency. To me this had no intuition at all. In fact it still doesn’t. However it works. Now many statistics books will go over determining the maximum likelihood estimator in painstaking detail, but then they’ll blow through the variance of the estimator in a few lines. The purpose of this post is to hopefully fill in those gaps. OK, getting closer. It’s starting to look like the result I showed at the beginning. We still need to find . Actually we just need to find since is a constant and does not impact the variance calculation. This entry was posted in MLE on October 29, 2011 by Clay Ford. Power is the probability ofÂ rejecting a null hypothesis when the alternative is true. Say your null hypothesis is and that your alternative hypothesis is . Further, say the true state of the world is such that . The probability we reject given that state of the world, that is make the correct decision, is called Power. 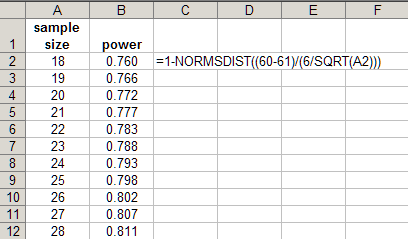 These formulas I’ve been using are power functions and they cry out for a spreadsheet. 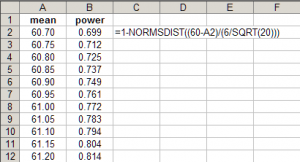 In one column enter various hypothesized means and then run a power function down an adjacent column to see how the power changes. You can do the same with sample size. So we see that the further away the true mean is from our cut-off point, or the bigger our sample, the higher our power. This is a very useful and practical exercise for planning an experiment. Using some conservative assumptions, we can ballpark a good sample size. A size that’s not too small (i.e., under-powered) nor a size that’s not too big. If our sample size is too small, we’ll have a low probability of rejecting a false null hypothesis. If our sample size is too big, we spend unnecessary time and money and effort on our experiment. This entry was posted in Power and sample size on October 4, 2011 by Clay Ford.